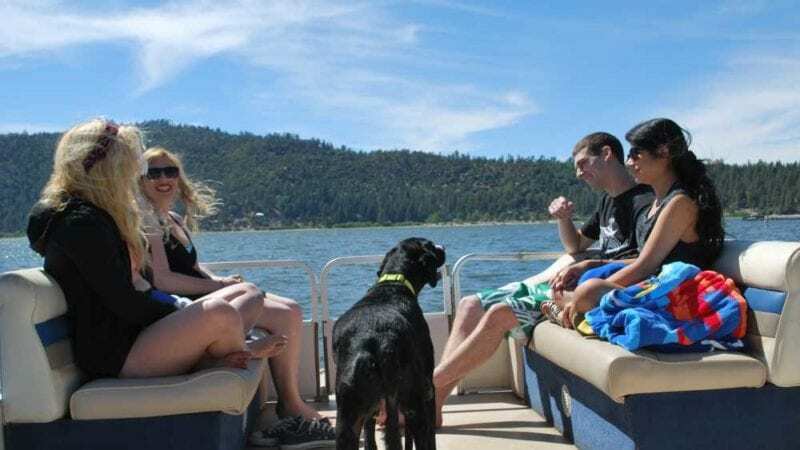 Nestled at 7,000 feet in the San Bernardino National Forest, Big Bear Lake is about a two-drive from nearly anywhere in southern California, making it a quick escape from city life. In winter, people flock to the mountain town for skiing, snowboarding and other outdoor activities. And spring through fall, the seven-mile long lake is a hub for an array of water activities. 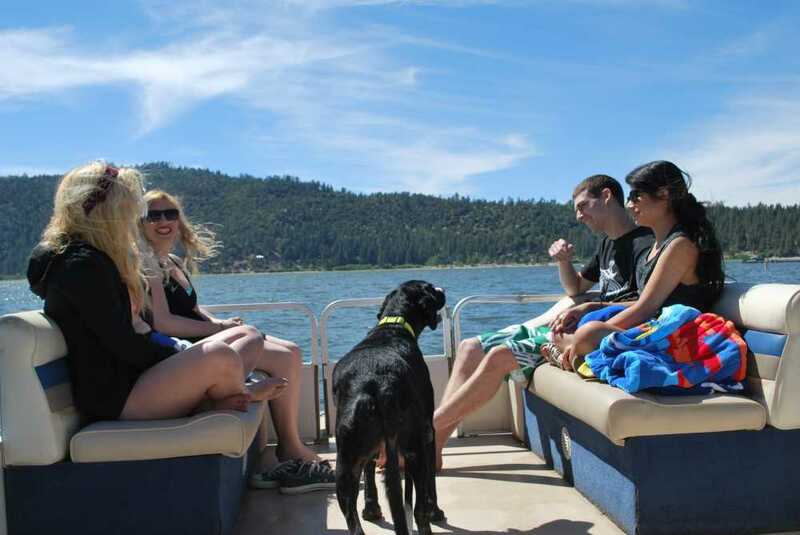 With four distinct seasons, Big Bear Lake is a year-round family fun destination. Shortly after the ascent begins to Big Bear Lake in the San Bernardino National Forest, the California landscape changes dramatically. The clogged freeways are replaced by mountain vistas with whiffs of pine drifting in through open car windows. Long before it became a popular ski resort for SoCal residents, Big Bear (named for the grizzlies that once roamed the area) attracted gold prospectors. William Holcomb, a bear hunter, discovered gold flakes in the backcountry in 1860. The gold rush lasted about 15 years. 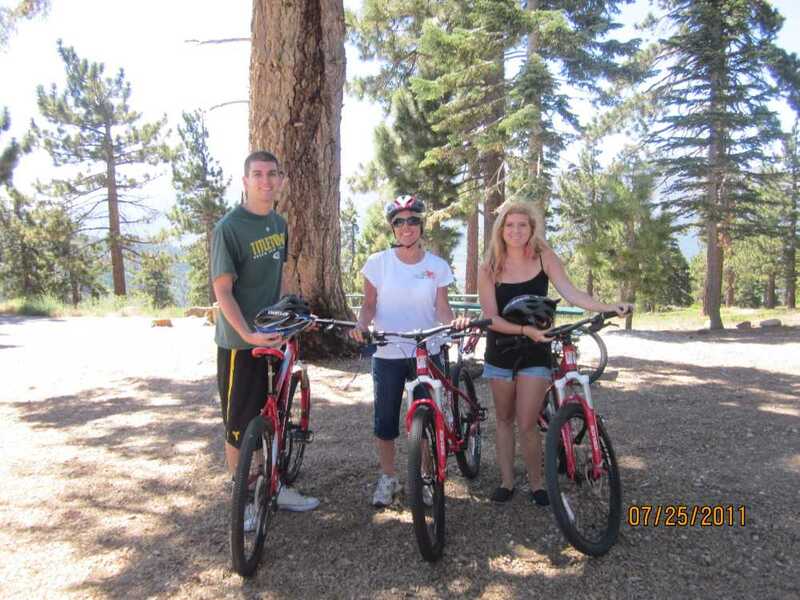 For my family, Big Bear holds many golden memories. Not only has it been our go-to ski resort for numerous years, we’ve enjoyed lake activities, hiking, biking and exploring the backcountry since our three kids were tots. It’s also where we discovered that our dog, Trooper, loves trotting on trails and splashing in the lake. One of the best things we like about Big Bear Lake is that it remains a laid-back, rustic mountain town with friendly locals. For us, it’s a home away from home all year long. Surrounded by towering pine trees, the lake sparkles like a jewel from the town, slopes and hiking trails. Fishing, kayaking, canoeing, stand-up paddle boarding, jet skiing, wakeboarding, boating and narrated boat tours are among the many fun activities to enjoy as a family. There’s also a small swim beach. One of our favorite things to do is cruise around the lake on a canopy-covered pontoon. They’re super easy to maneuver (take it from a non-boating family) and a lot of fun. We bring a picnic and admire the scenery while Trooper eyes the quacking ducks. We rent from Holloway’s Marina (909-866-5706). Fishing is another big activity here. If, like my family, you don’t have much luck catching fish, book a charter fishing excursion with Cantrell Guide Service (909-585-4017). These experts guarantee you’ll catch rainbow trout (trust me, it worked for us). In May, a fishing derby awards big bucks to a lucky angler who catches a tagged trout. 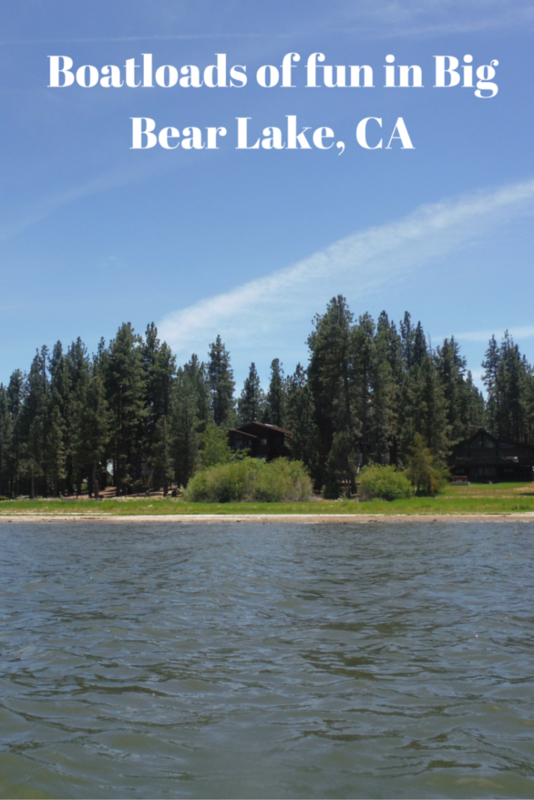 We’ve gone on narrated lake tours a few times and recommend them to newcomers to Big Bear Lake. Both Miss Liberty Paddlewheel Tour Boat and Time Bandit Pirate Ship (from the 1981 movie, “Time Bandit”) offer relaxing and interesting tours around the lake. Guides share area history while pointing out scenery, wildlife and mansions dotting the shores. 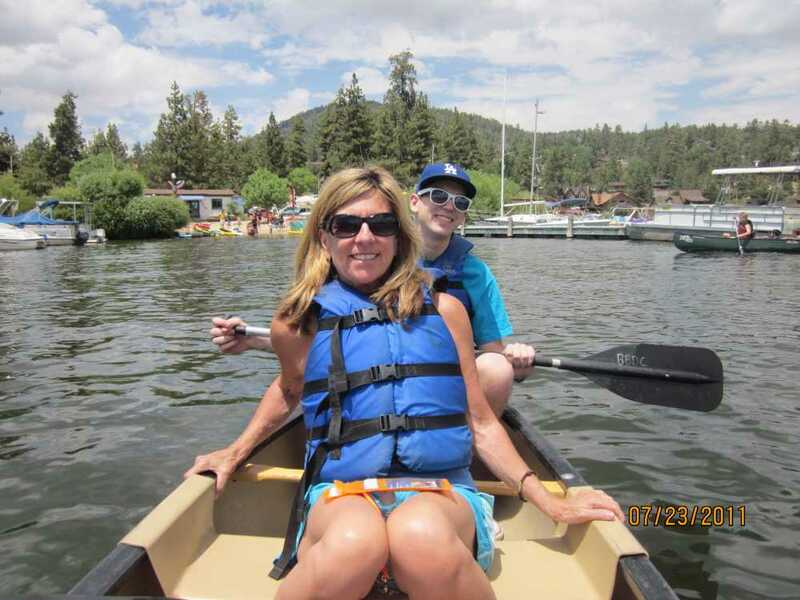 The Big Bear Discovery Center offers guided kayak and canoe tours for all abilities. These are a lot of fun because the guides show you were to see various shorebirds. Action Tours offers several adventure tours. Segways are a cool way to explore the town. Friendly guides share fun facts and point out landmarks, such as Big Bear’s first post office. The log house is where President Richard Nixon and his family stayed on vacation. Action tours also offers zip lining, fly boarding and tree rope climbing. On the north shore, the Alpine Pedal Path follows a portion of the lake. It’s ideal for walking or bike riding while enjoying gorgeous close-up lake views. We also like hiking along the portion of the 2,650-mile Pacific Crest Trail that travels from Mexico, through California, to Canada. 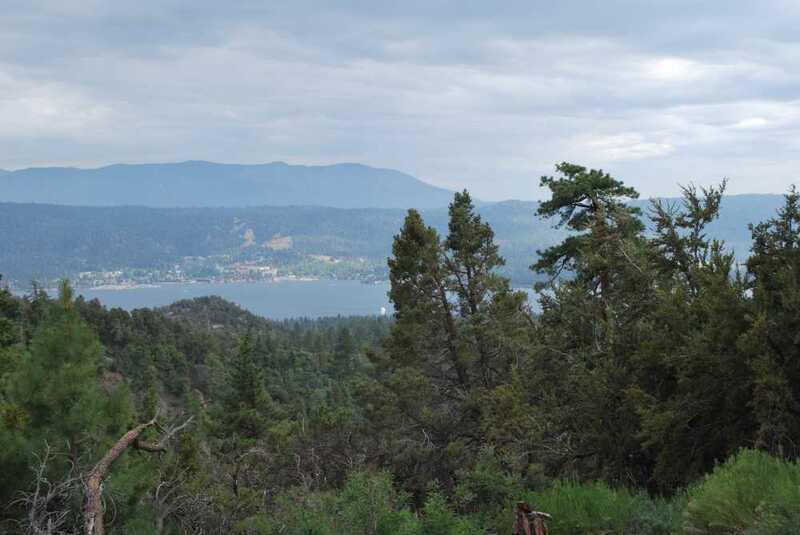 The scenic trail winds among pine trees, affording peek-a-boo lake views. In spring and summer, masses of wildflowers add a pop of color. In winter, the lake plays a big role in Big Bear’s snow-making capabilities. Big Bear gets natural snow, but has invested millions to ensure good coverage at both Snow Summit and Bear Mountain. While skiing, you can see the glittering lake from many vantage points. It’s a gorgeous backdrop to the snowy slopes. In summer, scenic chairlift rides bring you to the summit, where you can enjoy lunch and hiking. More adventurous families can bring mountain bikes up the lift and then ride down the slopes. After a day of play, it’s fun to stroll through the small village, comprised of about three blocks lined with mom and pop restaurants and shops. Although there are chain fast food eateries near the village, we prefer the diverse, local cuisine. This rustic mountain town has numerous and diverse dining options. For breakfast, we like Grizzly Manor Cafe, a hole-in-the wall eatery that serves huge portions. Tons of stickers plaster the walls, but don’t let that put you off. The food is fresh and good. 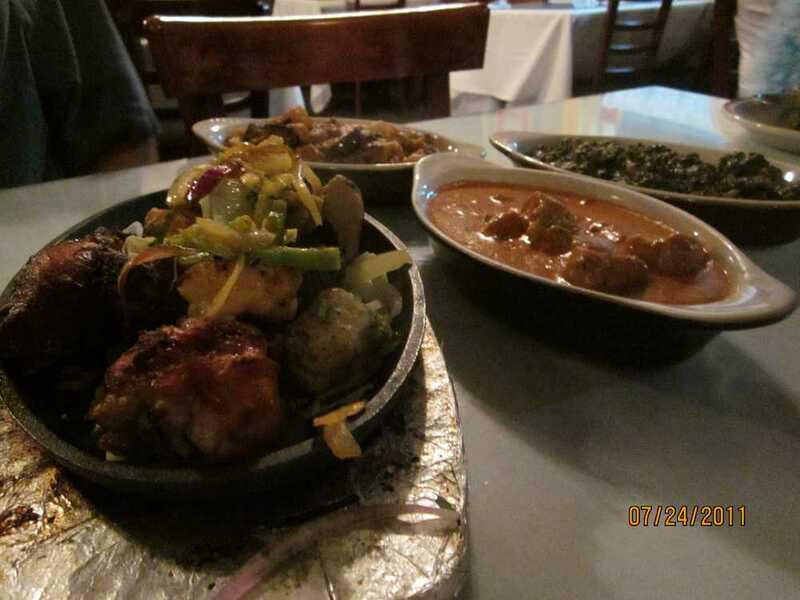 Another family favorite is the Himalayan Restaurant, which serves authentic Indian and Nepalese dishes. Over the years, we’ve stayed in quaint cabins, condos, a lodge and house rentals – and enjoyed them all for different reasons. In winter we stay near the slopes. In spring and summer, we opt for lakefront accommodations. 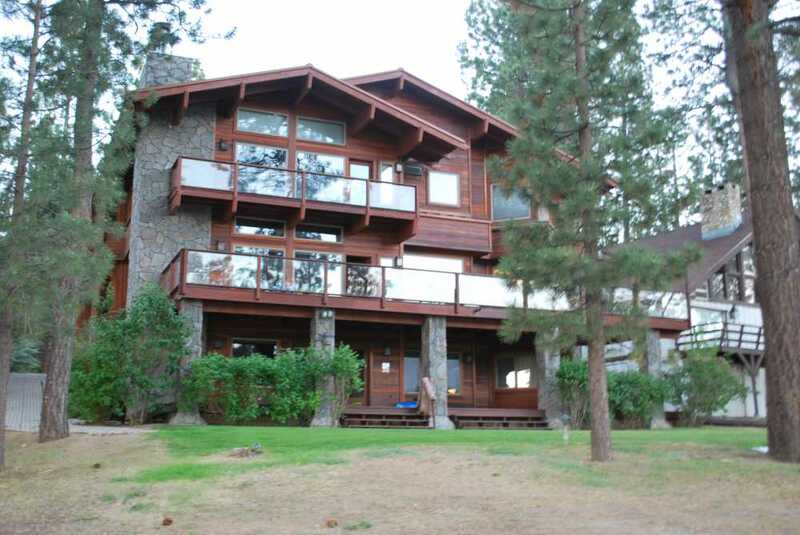 Last summer we stayed in a three-story lakeside house (named Eagle’s Nest) with five bedrooms that sleeps 14, a dream kitchen, rec room with pool table, and Jacuzzi booked through Big Bear Vacations. We were steps from the lake and a five-minute drive to the village, restaurants and grocery stores. What kinds of lake activities does your family enjoy? A Los Angeles native, Mimi Slawoff spent her childhood traveling with her parents and sister. The summers she spent living in Bulgaria with relatives fueled her love of travel and linguistics (she is fairly fluent in Bulgarian and stumbles through French). A former Los Angeles Daily News reporter, Mimi swapped news for travel writing when she became a mom. She freelances and writes a monthly family travel column for L.A. Parent magazine (www.laparent.com). Mimi's kids - Christina, Michael and Megan - have been traveling with her since they were tots and are now hooked on travel too.